Let’s Smash “Smash Up” Up | SPACE-BIFF! In an era in which many board games boast hefty rulebooks, Smash Up is deceptively simple to figure out. First, each of its 2 to 4 players (though it plays best with 4) picks two of the game’s eight 20-card decks and mixes them together. The decks have satisfying and distinct strengths: zombies overwhelm enemies with hordes from their discard pile, dinosaurs rely on brute strength, ninjas pull off surprise attacks during their opponents’ turns, pirates rove between bases and avoid fights they can’t win, wizards draw and play extra cards, and so on. Once everyone has created their faction, base cards are placed in the center of the table. These are the locations you’re trying to smash up, and you’ll be awarded victory points depending on whether you’re the first-, second-, or third-most smasher of that base. First one to 15 points wins the game. 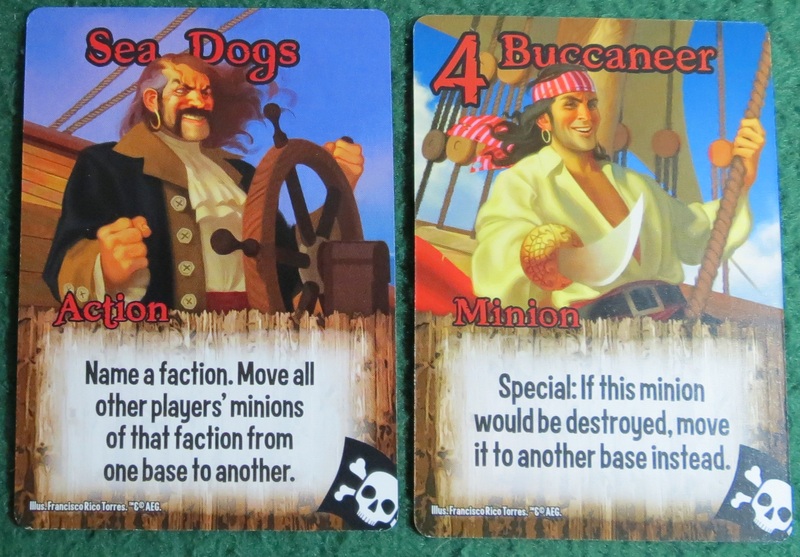 The order of play is similarly simple: on your turn, you play one action card and deploy one minion, check to see if any bases have been smashed (and thus scored), draw two cards, and the next player goes. That’s it. Breezy. Breezy in theory, anyway, because despite the simple rules and friendly art, Smash Up is actually a brutally mean game. Aliens will beam your minions back to your hand, endgame pirates or zombies will gleefully pile unbeatable hordes everywhere unless you go to extremes to stem the tide, and robots will summon and then buff an entire swarm of microbots out of nowhere. Ninjas will steal victories that you thought secure, wizards will give themselves seemingly endless supplies of cards and extra actions (so don’t let the player prone to analysis paralysis pick them, because those turns will take forever), and tricksters will transform bases into veritable minefields for your minions. Everyone’s got something supremely douchey up their sleeve, and after ten minutes of play it becomes clear that this particular crossover isn’t a friendly one. Bases. The top left number is defense, which must be overwhelmed to score the base. The three central numbers are victory points. Below is a special ability. There are a lot of things I like about Smash Up. For a game that looks so much like a filler game, the one that gets pulled out when waiting for your slow friend (every group’s got one), it’s surprisingly meaty, especially if your people are smart enough to pay attention to what everyone else is trying to do. It’s fun, has great art and a solid theme, and allows for a surprising amount of strategy. Heck, even the components and box are top notch — it scores a definite ★★★ in The Board Game Box Review with its ample and safe storage space. 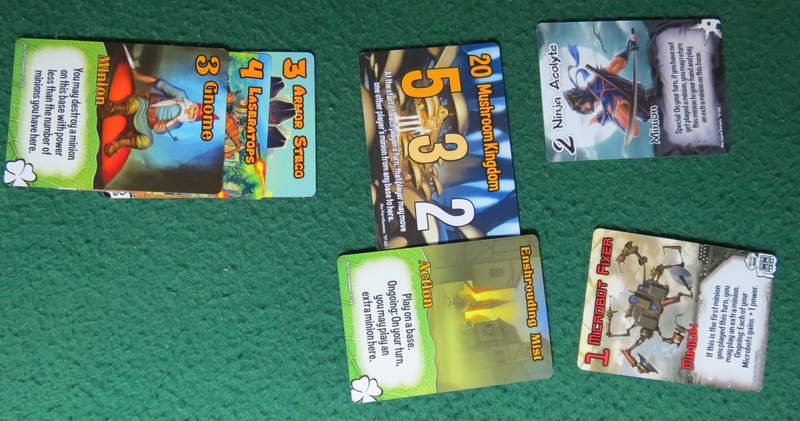 Certain base cards reward a player for coming in second (see the “Temple of Goju” in the picture above). This might seem clever, but in practice it just means that nobody plays minions there. Some factions can shunt their enemies around, so perhaps it would be feasible to pile enemy minions on those bases until they’re busted and scored, but that’s such a rare ability that it’s unlikely. 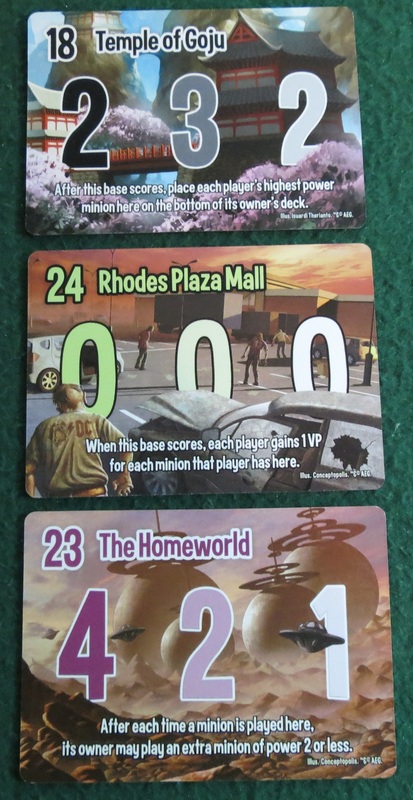 The game is played with three base cards, plus one for each player. That feels like one or two too many, especially in the four-player game. It should have come boxed with punch-out score counters or something. It currently requires players to keep track of their victory points with pencil and paper, or some other archaic method lost to the annals of history. The game’s status as neither filler nor meat forces it into an awkward non-niche in my gaming group. Fighting over the Mushroom Kingdom. I think that last point best expresses my reservations. While we enjoyed it, it’s unlikely we’ll play it very often. It occupies a strange place in my gaming library where I can see the appeal while entirely failing to feel it. Perhaps it just scratches an itch that I don’t have. So my final score is that this review isn’t very useful. It’s a good game, easily as good as many other light games out there, but with enough depth that you won’t be bored. If it sounds good to you, you may well love it. If not, who knows? Posted on November 14, 2012, in Board Game and tagged Alderac Entertainment Group, Board Games, Smash Up, The Board Game Box Review. Bookmark the permalink. 5 Comments. I actually just ordered this, as Amazon had it for 17 bucks shipped, and I’m looking for a game that is cheap, quick(ish), and doesn’t require a large group to play, a game that hopefully will get my friends into board games, where I can then move into some more interesting and involved games, many of which I found through this site. Smash Up is definitely good for that — straightforward, simple, and pretty fun, too. Pingback: Wheels Within Wheels Within Wheels | SPACE-BIFF!